posted on Feb. 05, 2019, at 9:00 a.m. 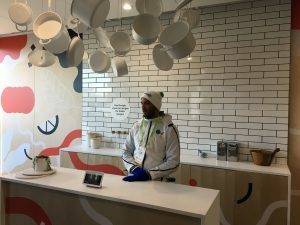 The almighty AI, dancing robots, and voice-controlled bathrooms were among some of the technology trends at the 2019 Consumer Electronics Show (CES). CES 2019 is now in the books, with over 188k attendees and 2.9 million square feet of show space. I clocked 30+ miles of walking. Let’s talk about the overall technology trends I noticed. AI, AI, AI. There was no doubt about it, everything will think for you. Like anything else, there is good and bad. The Good: Google really did a good job with its Google Assistant. Everything from recommending a meal and advising you on every aspect of preparing it, to getting you up a bit earlier because of a traffic jam on your commute, or having a conversation with someone who does not speak your language in real time with Google translator. Also on the plus side, having help of any kind is just a button press or voice command away. The Bad: Are you willing to give up some privacy for convenience and safety? All of this requires personal information from you — from wearables like an Apple watch or Garmin, to Alexa knowing your, or any, movement in your own home. Robots were everywhere, dancing, talking — you name it. What is a tech show, really, without a robot? 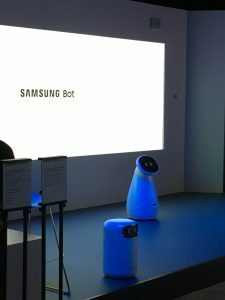 Located in the heart of the Las Vegas Convention Center was Samsung City and in it were some great examples of how robots can positively help us. Samsung calls its bots the “companions of the future.” At CES, they launched four new bots. The Bot Air uses sensors to monitor air quality and detect pollution sources. Similar to how a robotic vacuum works, the Air Bot travels from room to room to monitor and purify the air. Meanwhile, the Bot Care is designed to be a personal health-care assistant. Not only can it handle everyday tasks, but it can also be used to check blood pressure, heart rate and sleep patterns. Voice control is not new this year, but how manufactures are adapting it is. 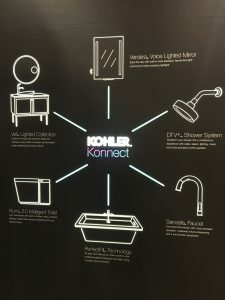 The KOHLER Konnect system leverages voice control for everything and transforms the bathroom experience with light, sound, color and water. Imagine this: you get up in the morning, walk into the bathroom, tell your mirror to light up at 50%, then ask about the day’s weather. You start brushing your teeth and then tell the faucet to turn on with warm water. Before stepping into the shower, you turn on the water, set the water pressure and temperature to your ideal setting, all with just a simple voice command. Now you don’t have to imagine that this is real — it is real, and it’s here today. The use cases are amazing. From aiding an aging loved one to helping a person with a disability, these applications help to make the home more comfortable, accessible and safe. Technology is amazing — sometimes intimidating — and possibly invasive. With that said, there are real ways it can improve our lives.